Turns out money doesn’t just buy a glamorous vacation in the Caribbean or a killer suite in Quebec — it can buy residency too. Instead, they enlist in citizenship by investment programs, where investing in a country’s economy can grant easy access to more powerful passports. Henley and Partners, the firm that operates Malta’s citizenship for sale scheme, has confirmed that it sought the advice of the Prime Minister and other government officials as it pondered taking legal action against journalist Daphne Caruana Galizia, a PN MP and the three independent media houses. It also said it was normal for it to be on a first name basis with government officials. Yesterday, Mrs Caruana Galizia published part of a leaked email chain which purportedly shows that Henley sought – and received – the PM’s approval to threaten to take legal action in an attempt to stop stories being written about it and the controversial passport for sale scheme. At some point it was decided to focus only on Caruana Galizia. The blogger also revealed that the Prime Minister, his chief of staff Keith Schembri, Justice Minister Owen Bonnici, and Jonathan Cardona, who is the IIP CEO, all used @josephmuscat.com email addresses rather than their official @gov.mt addresses. This, she said, was done so that the email correspondence would not pass through the government email servers. Prime Minister Joseph Muscat defended his trip to a citizenship conference in Dubai which took place just over a week after the brutal murder of journalist Daphne Caruana Galizia, by saying that that he must send the signal that the country is moving on, and that the country is open for business. Journalist Daphne Caruana Galizia was murdered by a car-bomb on 16 October, just down the road from her Bidnija home. Prime Minister Joseph Muscat left Malta for Dubai on 24 October, to address a conference called the 'Global Citizenship Seminar' by Henley & Partners. As he was exiting the launch of the Global Council for Tolerance and Peace launch yesterday, this newsroom asked the Prime Minister whether going abroad to a citizenship conference in Dubai while the country is in a state of mourning, where citizens are angry and upset over the murder of journalist Daphne Caruana Galizia was the wisest choice given the current state of the country. The Opposition was, at the time, hitting the Prime Minister with arguments that government was trying to continue with a business as usual attitude in the wake of the murder. Since Caruana Galizia’s murder there have been a number of demonstrations and protests organised by civil society. The Civil Society Network has thus far organised two national demonstrations for justice, the first being held on 22 October, just a couple of days before the Prime Minister’s trip to Dubai, and the second on 29 October. In both protests, demonstrators called for the removal of the police commissioner, the Attorney General and that they be replaced with two other nominees approved by two thirds of Parliament. The police commissioner and Attorney General still hold their posts. The sale of Maltese citizenship has been a cause of controversy since its inception, with a number of EU MEPs to this day slamming the practice. The Prime Minister over the past years attended a number of Henley and Partners citizenship conferences around the world. A Maltese scheme that allows wealthy investors to buy EU passports has drawn fresh criticism amid concerns over its opaque operation. The European Commission has been urged by MEPs to take action after Malta’s parliament questioned in a report the way the rights to run the scheme had been granted to a consultancy in Jersey. In their report, Maltese MPs said the government had failed to advertise properly the tender in international publications, leaving Henley & Partners, a Jersey consultancy that specialises in citizenship and visas, as the only credible bidder to run the scheme. They also complained that it had failed to reassure them there was no conflict of interest among those making the decision to appoint Henley & Partners. Roberta Metsola, an MEP from the centre-right European People’s party, said: “The sale of citizenship without any tangible connection to a member state is something that is of concern. European citizenship confers certain rights which should simply never just be put up for sale.” The Maltese MEP said such schemes raised questions “particularly in terms of transparency and security for this to be viable in the long term”. More than 1,000 passports have been issued by Malta as a result of the scheme, which was devised by Henley & Partners. Both the government and Henley & Partners denied wrongdoing. Malta in 2014 pressed ahead with plans to sell EU passports for €650,000 apiece, even after the European Parliament approved a non-binding resolution that an EU passport should not have a price tag. Malta later tightened eligibility criteria for applicants following an intervention from the commission. Malta’s programme has become a gateway for wealthy investors — mainly from politically unstable parts of the world — to secure a base in London. While relatively expensive, it promises a straightforward citizenship programme that then allows participants to operate throughout the 28-member bloc. London law firms say that as many as three-quarters of their clients seeking so-called investor passports go to Malta and Cyprus rather than use the UK’s more onerous system. Malta plans to sell 1,800 passports, primarily to wealthy people from Russia, China and the Middle East and expects to raise a one-off €1.2bn, almost a third of annual government revenue. The number of applications under the UK’s tier 1 visa scheme fell by 83 per cent in the first nine months of last year after the Home Office doubled the amount rich foreigners were required to invest. The origin of foreign millionaires buying a Maltese passport cannot be revealed as it may prejudice the government’s diplomatic relations with other counties, according to Identity Malta. Identity Malta’s decision not to release such information was supported by the Data Protection Commissioner, who was brought into the picture by the Times of Malta after seeking details on the so-called individual investor programme under the Freedom of Information Act. Following a year-long investigation, the Data Protection Commissioner found that the government agency was right in rejecting this newspaper’s request “as the entire information requested is such that the public interest that is served by non-disclosure outweighs the public interest in disclosure”. The cash-for-passport scheme – introduced just months into Labour’s return to power in 2013 – is still shrouded in secret with the government refusing to publish the names of those buying Maltese citizenship, which puts them on par with Maltese and EU citizens. A leaked report by the Financial Intelligence and Analysis Unit last year indicated that the government anti-money laundering agency had suspicions that the Prime Minister’s chief of staff, Keith Schembri, could have received kickbacks from proceeds of the passport scheme. Mr Schembri denied such allegations, insisting that the money in question in fact consisted of repayment of a loan made to Nexia BT’s Brian Tonna. In the wake of the report, the Times of Malta sought to establish the origin of those buying a Maltese passport and the agents submitting their applications. This newspaper asked for the number of passport buyers, their country of origin and the agencies that handled their application. Identity Malta immediately refused to disclose such details, citing the reasons for non-disclosure listed the Freedom of Information Act. Subsequently, the Times of Malta asked the Data Protection Commissioner to look into the matter, arguing that information it sought was in the public interest. However, the Data Protection Commissioner disagreed and concluded that the publication of such information “may prejudice relations with a number of the countries of origin” from where the passport buyers hailed. Identity Malta, he added, was also correct not to list the agencies involved “as this could reasonably be expected to prejudice commercial interests and, ultimately, the competitiveness of approved agents as it would reveal commercially-sensitive information”. Originally, foreign company Henley & Partners had been appointed as sole agent to sell Maltese passports but, after an uproar, the government decided to open the scheme to Maltese firms too, mainly lawyers’ and accountants’ partnerships and financial services providers. The government only publishes the names of the passport buyers together with those of other foreigners acquiring citizenship by naturalisation or through other ‘normal’ channels. Identity Malta said that, until the middle of last year, 679 foreigners had bought Maltese citizenship. The majority, 362, originated from European countries, followed by 100 from the Gulf region and another 92 from Asia. VALLETTA, Malta — An advisory firm that plays a major role in promoting the citizenship by investment (CBI) programs run by Grenada and Saint Lucia, and also was similarly involved in the corresponding program in St Kitts and Nevis, has been accused of conspiring to assassinate a Maltese journalist who was killed by a car bomb earlier this week. Daphne Caruana Galizia, 53, a journalist who led the Panama Papers investigation into corruption in Malta, had recently filed a police report complaining of death threats. She had exposed numerous offshore dealings of prominent figures in Malta and was also the mother of International Consortium of Investigative Journalists (ICIJ) developer and data journalist Matthew Caruana Galizia. The chairman of citizenship consultants Henley and Partners, Christian Kalin, has now been named by Caruana Galizia’s children as being part of a “gang of crooks” who sought to “financially cripple” the renowned journalist. “There was a gang of crooks, including Christian Kalin of Henley and Partners, and lawyers at Mischon de Reya in London, who conspired with politicians in Malta to financially cripple my mother with one vexatious lawsuit after another,” Matthew Caruana Galizia posted on Facebook. In May she reported that she had “evidence in the form of email exchanges” that legal action by Henley and Partners against her was “taken on instruction from, and in collusion with” Maltese Prime Minister Joseph Muscat, his chief of staff Keith Schembri, and Justice Minister Owen Bonnici. Henley and Partners were recently implicated in a regional controversy after a report was published online on August 18, 2017 concerning an alleged scheme to obtain a diplomatic passport from the government of Grenada for a Ukrainian businessman, in exchange for a payment of US$1 million to a purported Henley account with wells Fargo Singapore. Browne responded that “we do not sell diplomatic appointments; therefore, the country concerned could not be Antigua and Barbuda… If perchance someone represented that they could sell you an Antiguan diplomatic appointment, you need to move quickly to recover your funds, because that [the sale of diplomatic passports] is not possible under the stewardship of my government”. “Chris” was later identified in online report as Christopher Willis, the former managing partner of Henley & Partners Caribbean, who has since left the firm. On November 14, 2016, the Ukrainian businessman sent the same inquiry to Grenada member of parliament, Alexandra Otway-Noel, then the minister responsible for the Grenada citizenship by investment programme. One week later on November 21, 2016, he told Ottway-Noel that he had “received confirmation from Chris who has confirmed funds will be returned within three days”. Ottway-Noel resigned in January 2017 as a member of the ruling New National Party (NNP) government in Grenada. In a press statement on August 21, 2017, the government of Grenada denied “any knowledge of this allegation or activity”, a position that was not supported by the facts in the light of the emails regarding the matter written by Ottway-Noel at a time when she was a senior government minister. Ottway-Noel has since confirmed that she did in fact receive the emails in question and responded as reported. However, again this assertion is contradicted by history and the granting of Grenada diplomatic passports in questionable circumstances by previous administrations led by current prime minister, Dr Keith Mitchell, has been dealt with extensively in leaked diplomatic cables from the US embassy in Bridgetown, published by Wikileaks. Further, on its face, the message in question represented an apparent attempt at extortion by Henley in seeking to obtain a commercial advantage by means of a threat. To compound the situation, in a widely disseminated “media statement” dated Thursday, August 24, 2017, Henley falsely claimed that the government of Antigua and Barbuda had confirmed in a separate statement that allegations concerning the “sale” of diplomatic passports are completely false. The government of Antigua and Barbuda had issued no such statement, and in fact would be incapable of doing so since it had already made clear that it had no knowledge whatsoever of the events and circumstances in question. The claim by Henley that it did so was accordingly an outright lie. Henley never responded to a request to produce the statement in question that it claimed to have been issued by the government of Antigua and Barbuda. The publication of such a lie as fact by Henley represented the dissemination of “fake news” which, in an even more bizarre turn of events, its US lawyers acknowledged in a letter dated August 29, 2017, to Caribbean News Now, confirming that the making of false claims and the dissemination of “fake news” by its client constituted “criminal conduct”. A complaint against Henley in this respect has been filed with the Federal Bureau of Investigation and other relevant US federal agencies. NEW YORK – A rare protective passport signed by Swedish diplomat Raoul Wallenberg and used to transport Hungarian Jews into Sweden during World War II was sold for $13,310 after attracting four bids at an auction in Los Angeles. Wallenberg, who was fluent in Hungarian, saved the lives of thousands of Hungarian Jews during WWII by issuing fake protective passports, which claimed Jewish individuals being deported to concentration camps were actually Swedish citizens awaiting repatriation. This was part of a relief effort put together by the United States The passports were often accepted by German and Hungarian authorities. Jews holding these passports were treated as Swedish citizens and were exempt from wearing Jewish yellow star badges. Wallenberg was captured in early 1945. Little is known about what may have happened to him, but many believe he was seized by the Soviets and died some years later in a Russian labor camp. The passport sold on Thursday was offered during an auction organized by Nate D. Sanders Auctions, which specializes in documents and autographs.It was issued on September 22, 1944, in Budapest by the Royal Swedish Embassy and was signed by Raoul Wallenberg. It measures some 20 centimeters by 15 centimeters and has a single vertical fold, with separation starting at its ends. Bidding for the passport began at $8,000 and attracted four bidders before being sold. Nate D. Sanders Auctions would not disclose the identity of the buyer. They seem to have taken advantage of South Korea's expertise in plastic surgery — it's the world capital of cosmetic procedures after all. Friendcation fun, right? But the problem came when they tried to board a plane back home with bandaged and swollen faces. According to AsiaOne, Chinese TV host Jian Huahua posted the photo on Weibo with this caption: "Received from frontline personnel at the airport during the holidays: These women made use of the long holidays to undergo plastic surgery in South Korea. On the way back, they were unable to leave the country and had to await proof of identification. Even your mother won't recognise you." But all might not be as it seems: South Korea is disputing this story. According to Shanghaiist, South Korea's Ministry of Justice told South Korean newspaper Chosun Ilbo that this story was "fake news" without "any basis in facts." As well, the Chinese TV anchor deleted the photo from her social media account. Still, if you travel for significant cosmetic procedures, it might be worth taking a few more days to rest up and heal post-surgery, before trying to board an international flight. The more you know. Getting a new passport photo can feel like a lot of pressure: First, you have to follow the ever-changing rules and regulations. And then you have to try to look as cute as possible for an image you’ll carry with you for a decade in one of the most important documents you’ll ever have. So imagine one woman’s surprise when she thought she’d done everything right — posing for a cute and ordinary snapshot and sending it off for processing. But when her new passport arrived in the mail, Austin’s Chelsey Ramos didn’t look quite like herself. In fact, the state department had stretched her imagine into a pretty hilarious, and rather unflattering, conehead. 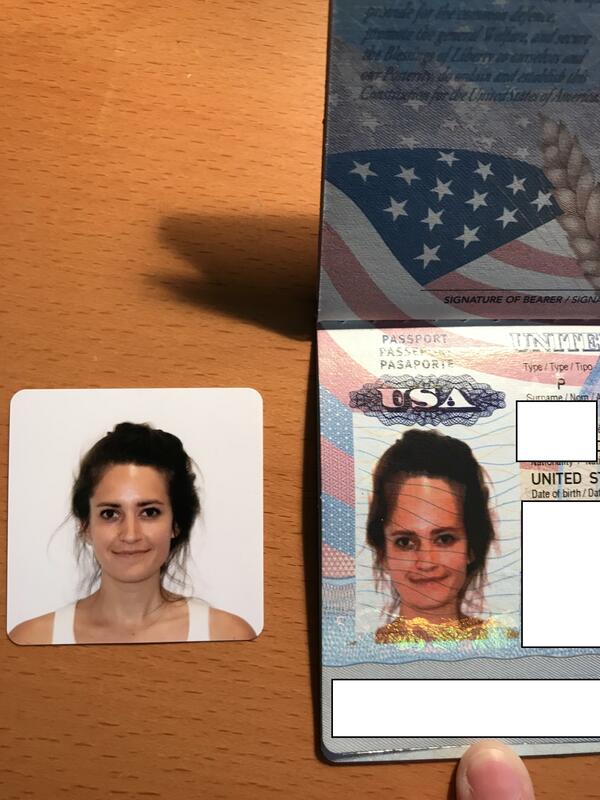 Her boyfriend posted the image on Reddit, noting, “The State Department nailed my girlfriend's passport.” It’s since gone viral. But the star of the viral photo told Travel + Leisure she’d actually be kind of into it, except for the fear that keeping it as is could mess with her future ability to travel. The British passport would be worth the same as Argentina's if the rights of free movement are stripped from the UK in a hard Brexit, according to a study of passport power. The study, by citizenship planning firm Henley and Partners, takes into account how many countries can be visited without applying for a visa. Currently Germany tops the league with 177 countries open out of a maximum of 218. The UK is joint-third with France, Italy and Spain at 175 countries. Argentina is down in 22nd place, below Romania, San Marino and Chile. "We did studies of what makes one nationality more valuable than another, and of course the British nationality is one of the best in the world," Professor Dimitry Kochenov at the University of Groningen, who compiled the report, said at a conference in London. "And then just as a joke we looked at the effect of Brexit – hard Brexit without any free movement with full detachment from the rights that come from the European Union – and it ended up with the UK passport at the level of the Argentine document," Kochenov said. He added: "That's why this war against common sense waged by the government of this country is extremely dangerous. The stakes are extremely high." The British passport faces an overhaul once the Brexit negotiations, due to start next year, are completed. While the words "European Union" will disappear from the front of the passports, the government has indicated that their colour could also change from burgundy to blue, The Times reported in September. "We are considering potential changes to the UK passport after the UK has left the European Union," the immigration minister, Robert Goodwill, said in reply to a parliamentary questionabout reintroducing Britain's "old blue style passport" from the Conservative MP Julian Knight. Kochenov said that London would be hardest hit in a hard Brexit scenario, where the government prioritises immigration control over keeping some aspects of single market membership. In that case, a separate "London citizenship" may make sense. "A London visa, while it might sound absurd, might actually be a good idea given the drastic gap between what the government thinks is good and what really is good for London," Kochenov said. "A city can actually exist disconnected from the physical area surrounding it as long as its connected to a strong economy somewhere else," he added. "There has been a sharp increase worldwide in the number of individuals wanting to acquire a beneficial second or third residence or citizenship to globalize their family’s opportunities and expand their business interests in a changing and uncertain world," said Dominic Volek, head of Southeast Asia for Henley & Partners, a citizenship consultancy firm. LONDON – The South Pacific island nation of Vanuatu will accept payments in Bitcoin for its $200,000 citizenship program, becoming the first country to accept the cryptocurrency in return for citizen status. Bitcoin is trading at $4,581 at current market rates, meaning Vanuatu's citizenship by investment program would cost around 43.64 bitcoin. Vanuatu also advertises its low taxes for citizenship buyers, offering a second passport in a country that levies no capital gains or income taxes. Potential citizens don't need to live in Vanuatu, or even visit the country once. James Harris, managing director of the Vanuatu Information Centre Network said: "There remains some suspicion surrounding the use of crypto-currency in financial transactions, and some fears that it can be related to undesirable activities. "In fact, the opposite is true, as crypto-currency exists in a fully traceable ledger where the entire history of its creation and trading is visible," he said. Earlier this year, the Thai government started offering "elite" residency visas for wealthy foreign citizens, allowing them to live in the country for around $3,000 (£2,403) a year. There are seven different packages, with the most expensive being the "Elite Ultimate Privilege" scheme. It costs $60,000 for 20 years residency, along with a $600 a year membership fee. The Prime Minister will be promoting the sale of Maltese passports during two key events organised by Henley & Partners in Dubai and Hong Kong. Joseph Muscat and Keith Schembri with Henley president Chris Kalin. Joseph Muscat is set to travel to the United Arab Emirates later this month to participate in a global citizenship seminar organised by Henley, the Maltese passport scheme’s concessionaire. He will be delivering a “special keynote speech” during the event, being held on October 25 at the Palace Hotel, one of the most luxurious properties in Dubai. According to Henley & Partners, the seminar will focus on how affluent and talented individuals can acquire an additional passport through strategic investment. Less than a month later, on November 14, Dr Muscat will address a global residence and citizenship conference, an annual event by Henley & Partners, in Hong Kong. Around 500 delegates from around the world seeking more information on how to obtain a second passport through investment are expected to attend the Hong Kong event. Passport schemes offered mainly by Caribbean countries will be marketed during the two-day conference, though Portugal and Cyprus will also be promoting their programmes. During his first term as Prime Minister, Dr Muscat participated in 11 conferences and seminars around the globe promoting Malta’s cash-for-passports scheme, officially known as the Individual Investor Programme, which was launched soon after Labour returned to government in 2013.
Henley & Partners have been given the concession to market the scheme abroad, with the contract binding senior members of the Maltese government to participate in sales promotions around the world. Promotional events have been held in the United Kingdom, the United States, Singapore, Turkey, the UAE, Lebanon and Switzerland. No replies were forthcoming when this newspaper asked the Office of the Prime Minister about the upcoming trips to Dubai and Hong Kong and whether the contract with Henley & Partners obliged Dr Muscat himself to participate personally in such activities. According to the latest data given by the scheme’s regulator, there were 723 applicants and 1,186 dependents seeking a Maltese passport at the end of June. The government does not publish the particulars of those acquiring a passport through the scheme, only their names. A leaked report by the Financial Intelligence Analysis Unit raised suspicions about the possibility of the Prime Minister’s chief of staff, Keith Schembri, receiving kickbacks from the scheme. The government’s anti-money-laundering agency recommended that the police investigate further, but it cannot be ascertained whether this in fact happened. Mr Schembri has denied any wrongdoing, and a magisterial inquiry into the matter, sparked by former Opposition leader Simon Busuttil, is ongoing. More than 3,100 Americans shed their citizenship last year, FBI figures show. The numbers come from published statistics and documents obtained by Global News under U.S. freedom-of-information laws. Vladimir Gusinsky, a former Russian media magnate wanted back home on fraud charges, was granted Spanish citizenship by special order of the government in Madrid, the EU nation's Cabinet said Monday. MADRID, February 26 (RIA Novosti) - Vladimir Gusinsky, a former Russian media magnate wanted back home on fraud charges, was granted Spanish citizenship by special order of the government in Madrid, the EU nation's Cabinet said Monday. Spanish media Sunday cited the protocol of a February 9 session of the Spanish Council of Ministers as saying that Gusinsky, 54, had become a Spanish national. "Spanish authorities use this form of granting citizenship - on 'special instructions' (por carta de naturaleza) - only in special cases," said Russian Yelena Feoktistova, a member of the Madrid Bar Association. Now Russian authorities cannot seek the extradition of Gusinsky, who also holds an Israeli passport, from Spain. The Spanish citizenship also enables the businessman, who amassed his fortune in the controversial privatization campaign in post-Soviet Russia in the early 1990s, to travel throughout the EU without fearing arrest on a Russian request. The press service of the Spanish government declined to comment on the decision. Gusinsky, former head of the Media-Most Group, which set up Russia's once top independent TV channel - NTV, faced fraud charges for the first time in the summer of 2000. The charges were dropped after the businessman signed papers turning over ownership of the media holding to Russia's state-run gas monopoly Gazprom. The channel did not support Vladimir Putin's first election campaign in early 2000. Gusinsky left for Spain where he stayed until Russian prosecutors pressed fraud charges against him again later that year. The tycoon was detained following a Russian extradition request in December 2000 in a millionaires' village of Sotogrande, in southern Spain, where he was living. Spanish authorities refused to extradite Gusinsky, calling him "a victim of political purges," and released him a few months later. Another exiled Russian oligarch, Boris Berezovsky, was granted political asylum in Britain in 2003. He had to give up his ownership of the ORT television channel to another tycoon, Roman Abramovich, in the early 2000s. Abramovich later handed over his controlling stake to the government. By the standards of The Bishops Avenue, one of the wealthiest enclaves in the world, Vipram House is nothing to write home about. While some of the north London street’s properties can change hands for dozens of millions of pounds, two years ago Vipram House sold for just £10m. Less attention was lavished on the circumstances of the sale. Carlton House had been seized in connection with a massive international fraud case, involving billions of dollars allegedly looted from a Kazakh bank. Hundreds of companies, many offshore, had their assets frozen in an attempt to recover the funds. Eight years and dozens of court cases later, the bank is still pursuing its own ex-chairman for the billions it alleges he stole. Now, one of the myriad legal disputes to result from the Kazakh bank case has shed new light on a little-known immigration scheme used by the family at the centre of the scandal. Madiyar Ablyazov was born in Kazakhstan in 1992, to Alma Shalabayeva and her husband Mukhtar Ablyazov. He lived there until the age of 10, then relocated to London and the luxury of Carlton House, where he lived with his aunt and uncle while studying at private schools, including Northbridge House and Highgate. In 2008, as he approached the end of his studies, his family began contemplating alternatives that would allow him to remain in the country. Their eventual solution was an immigration scheme known as a “golden visa”. Officially called a “Tier 1 investor” visa in the UK, the scheme gives individuals residency in exchange for investing £2m in UK bonds or shares through a bank, with applicants eligible for indefinite leave to remain, and even full citizenship, after five years. That is, unless they can stump up more cash: those offering £5m can settle after three years, and those with £10m after just two. Because the original investment is returned to the applicant along with any interest accrued, the state technically makes a loss on each visa. But supporters of the scheme argue that as well as an investment in gilts – effectively a loan to the government – the country attracts people with substantial sums of money to spend on goods, hire workers or pay taxes. Plenty of other countries, Malta, Cyprus and Portugal among them, offer rival schemes, with varying terms. The US’s EB-5 pathway, for instance, exchanges passports for a $1m investment in any business that will create at least 10 jobs (the former company of Jared Kushner was recently found hawking these visas in China). But all are fundamentally offering the same trade: show us the money, and in return receive residency, citizenship or passports. What sort of people buy a golden visa? “The common trait is they’re very successful business people,” says John Hanafin, chief executive officer of Arton Capital, which specialises in what is known in the trade as “investment migration”. Many of his clients, often from the Middle East or Africa, want the mobility that a second passport entails, with those granting EU access especially highly prized. For some, it may come as a surprise to learn that residence or citizenship can effectively be bought. But the idea has been around for some time, first being pioneered by the tiny twin islands of St Kitts and Nevis in 1984. In 1994 then-home secretary Michael Howard faced a minor political scandal after a leaked white paper on improving the UK’s “competitiveness” included a provision for ‘immigrant investors’. Labour slammed the scheme as a plot to allow wealthy Tory donors to “jump the queue” into the UK. But after that brief outrage the scheme receded from public view, and has never played any major role in the country’s years of bitter discourse about foreigners or immigrants. The steadily rising cost of immigration bureaucracy has already helped to effectively exclude immigrants without resources; the cost of submitting an indefinite leave to remain application rose 18% to £2,297 earlier this year. But beyond this, the system has tended to assume that the more money an applicant has, the better an immigrant they will be, without ever quite explaining why. The Highly Skilled Migrant Programme, a points-based system introduced under Labour in 2002, awarded more points for those with higher earnings. Golden visas simply take this principle to its logical extreme: the only merit an immigrant need demonstrate is their wealth. The phrase “blind faith period” is used by anti-corruption campaigners to refer to 2008 to 2015, when checks on applicants and their wealth were the responsibility of neither the British government nor applicants’ banks. “The Home Office assumed that the banks were doing the checks on the individuals, and the banks themselves were assuming that, because this individual was applying for a visa via the Home Office, the checks would be done further down the line,” says Hirst. Attempts to prove this either way by journalists or campaigners always hit the same stumbling block: applicants’ names are secret. Until last year, that is, when one of the dozens of Ablyazov fraud cases reached the high court. In January 2008 – right at the beginning of the blind faith period – the Ablyazovs began applying for Madiyar’s Tier 1 investor visa. Solicitors were hired, Swiss bank accounts were opened, and funds of just over £1m were put into Madiyar’s name (the investment threshold was raised to £2m in 2015). As part of the process, the family provided the UK Border Agency with a “memorandum of gift”. The document, which bore the signatures of both father and son, stated: “[Madiyar] has been gifted £1m sterling. [Madiyar] is the recipient of the gift,” and identified Mukhtar as his benefactor. The application was filed in March 2009, and two months later Madiyar was granted his Tier 1 visa. Around the same time, however, Mukhtar fled Kazakhstan for London. BTA Bank, which he had chaired since 2005, was being probed by regulators, who had found that almost 20% of its loan portfolio was “non-performing” (meaning the debtors were missing their scheduled payments, and the loans were likely to default). As of December last year, BTA had been awarded judgments in its favour to the tune of $4.9bn, which it is still trying to recover from Mukhtar. His son Madiyar, meanwhile, has mostly flown under the radar, going on to work in a financial services firm and a startup in Geneva. In 2013 he obtained indefinite leave to remain in the UK, and in 2014 his investment matured. It is unclear what, if any, due diligence checks the Home Office carried out on the Ablyazovs. By the time Madiyar applied for indefinite leave to remain, the fraud allegations against his father were the subject of international media coverage. A cursory Google search would have been more than enough to uncover the fraud allegations around Ablyazov money. And crucially, the Home Office had the signed memorandum of gift, confirming the cash financing his investment originally belonged to his father. The Home Office has effectively admitted to never having reviewed the 3,000 blind faith golden visa applicants to identify how many of them are “politically exposed persons” – foreign officials considered high risk for corruption. With each having invested at least £1m, up to £3bn could have entered the scheme to finance the British government, with no checks on the source of the cash. Today, with the terms of Britain’s exit from the EU still to be decided, the Tier 1 scheme’s future looks perilous. Instead, the British are wondering if they might like to acquire golden visas elsewhere instead. “We never had inquiries from British people in our industry before, and for the first time we’re getting inquiries from British people saying, ‘What will it mean for me to have a British passport if I can’t go to Europe?’” says Hanafin. BTA ultimately lost its claim to recover the money used to fund Madiyar’s golden visa, despite it having originated from an offshore company named on an asset freezing order, effectively on the grounds that Mukhtar wasn’t intending to put the money beyond the reach of the bank when he gave his son the cash. For their part, the Ablyazovs maintain their innocence. Madiyar declined to comment, but his lawyer stressed that he had spent the majority of his life in Britain, and been found by the UK courts to have acted in full compliance with the law in applying for and receiving his investor visa. Mukhtar, meanwhile, has successfully resisted efforts by Russia, Kazakhstan and Ukraine to extradite him from France. His defence, supported by human rights groups as well as the UN special rapporteur on torture, rested on the risk he would face as a political opponent of Kazakh president Nursultan Nazarbayev. The Ablyazovs have accused Nazarbayev of coordinating a campaign of persecution against them, with the lawsuit to recover the investor visa money just one aspect thereof. In 2008 the Times reported that Nazarbayev had used a frontman to secretly buy the £50m Toprak mansion. It too has an indulgent Turkish bath. It too has seven bedrooms. And it too is located on The Bishops Avenue, just three doors down from the Ablyazovs, long since departed from understated Carlton House. Malta has announced it is selling passports to foreign investors for £546,000, but that's cheap compared with other countries, such as Britain and the US. itizenship is like rhythm: if you weren't born with it, it's not easy to get. However, in the EU there is a fast-track for the super-rich. The Maltese government now has a scheme to attract "high-value" foreigners to the country, by selling passports for £546,000. Which, by passport standards, is pretty cheap. The move has ruffled feathers in the UK. In part, because of worries about unchecked immigration; the passport grants its holders full EU citizenship, including freedom of movement (Maltese citizenship also come with a visa waiver on entry to the US). Labour's shadow immigration minister, David Hanson, told the Financial Times the move risked being "a backdoor route" to EU residence and was "not a tight or appropriate immigration policy". The government faces calls from British and European politicians to intervene and put a stop to the plan. But the main reason the UK is annoyed is not because we worry foreign millionaires will come here to claim benefits. It is probably that Malta's scheme is more attractive than our own deal for super-rich settlers. The British equivalent, the Tier 1 (Investor) visa programme, assesses applicants on the basis of their ability "to invest £1,000,000 in the UK". Foreign investors who hold £10m of their money here can apply for permanent residence after two years living in the country. Compared to Malta's plan, it looks like a load of hassle. The European schemes tend to be more lenient. Greece, Cyprus and Macedoniaoffer fast-track resident permits for foreign investors who spend a minimum of €250,000 to €400,000 (£210,000 to £335,000) in the country. Spain grants a residency visa to foreign buyers who spend €500,000 (£418,000) or more on Spanish property, though the wait for permanent residency and EU citizenship is five years. The major beneficiaries of such schemes are the Chinese global rich. Since October last yea, 318 residence permits have been issued in Portugal to foreign property buyers who spent over €500,000. Of these, 248 went to Chinese nationals; 15 went to Russians, and nine each to Angolans and Brazilians. The Maltese system may be the most open of the lot: its applicants do not need to be resident in the country, and are not expected to prove any further investment in the islands' economy. It is expected to attract around 40 people in its first year, rising to 300 a year from 2014. But their stay may be short-lived. Polls show 53% of Maltese oppose the move, and the opposition leader, Simon Busutil of the Nationalist Party, has pledged to revoke the passports if returned to power. In fairness to him, it won't be hard to expel citizens who have never actually lived there in the first place. It is the perfect occasion for one of Iran’s many talented film directors to turn to the world of international espionage. Poor Iran certainly has been exposed to enough of it since its revolution in 1979, though you wouldn’t know it from reading the news or watching Hollywood movies. Fast forward to November 2012, when unceasing Israeli demands for an invasion of Iran reached a frenzied peak , with the breaking of diplomatic relations with Tehran by Ottawa, a few hours before “Argo” premiered at the Toronto International Film Festival. Sam smells a rat. Who dunnit? Who is responsible for this string of humiliating , criminal coincidences, for dragging Canada through the diplomatic mud? Banning a British MP, breaking diplomatic relations with a peaceful state, issuing a fugitive Mossad assassin a new identity on a shiny new Canadian passport? Suraski? Attias? How about Harper? If you have been thinking about leaving the United States, moving to another country and changing your nationality, it's never been easier to do. In this era of globalization, citizenship and passports have become just another commodity to be bought and sold on the international market. All you need is money and a willingness to contribute a few hundred thousand dollars to the treasury of a cash-starved country or acquire a piece of real estate there. It's called citizenship by investment and, as we first reported in January, it's become a $2 billion industry built around people looking for a change of scenery or a change of passport, a new life or maybe a new identity, a getaway from the rat race, or perhaps an escape from an ex-spouse or Interpol. In any event, it's brought in huge amounts of revenue for the sellers and attracted among the buyers a rogue's gallery of scoundrels, fugitives, tax cheats, and possibly much worse. If you're shopping for another passport, the top of the line right now is Malta. By investing a million dollars in this Mediterranean island, a Russian or Chinese or a Saudi can become a European citizen with a new EU passport that will allow them to travel just about anywhere without a visa. There are also much cheaper, less discriminating alternatives available in the Caribbean, especially on the tiny island of Dominica, where Lennox Linton is a member of Parliament. Steve Kroft: How much does it cost to get a citizenship? Steve Kroft: Do you have to come and live in Dominica? Lennox Linton: No. No. You don't even have to come to Dominica to get the citizenship. You pay the money from wherever you are. Steve Kroft: Sorta just mail order citizenship? Lennox Linton: Sort of. Something like that. Our introduction to this world of citizenship by investment came in Dubai – the gleaming, international bazaar – that was hosting the 9th annual global citizenship conference. Gathered here were government officials, lawyers, bankers, and real estate developers who facilitate and profit from the trade of citizenship for cash. This is the man who more or less invented the business: Chris Kalin, chairman of Henley and Partners, a consulting firm with offices, where else, but in Zurich, Switzerland. For a fee and healthy commissions, Kalin helps countries set up their program, rewrite their citizenship laws, and recruit people of means looking for a second, third, or fourth passport, which he sees as just another travel accessory; a passport of convenience. Chris Kalin: You probably have more than one credit card, I would assume. And, you know, if Visa doesn't work, Mastercard will do. So I think any wealthy person nowadays should have more than one credit card. And likewise, you'd have more than one passport. Steve Kroft: But you need to have some money to do this? Steve Kroft: To be able to do this? Chris Kalin: Yes, absolutely. It's just for wealthy people, of course, yeah. Quite often these wealthy customers come from politically problematic countries where their passports don't work very well, making it difficult for them to get where they want to go. Global citizens like international lawyer Sirous Motevassel, a Middle Easterner from Iran who travels on a West Indian passport from St. Kitts and Nevis. Steve Kroft: And where do you live? Sirious Motevassel: I'm living in Dubai, United Arab Emirates. Steve Kroft: So you're an Iranian living in Dubai with St. Kitts citizenship. Sirious Motevassel: Yeah. It, yeah. This is the life. It's the life, because Motevassel's St. Kitts passport, available for $250,000 or a $400,000 real estate investment, allows him entry to more than 100 countries without having to get special permission. It's a legal way to circumvent visa controls that nations set up to screen people coming into their country. But it's also an opportunity for shady characters to mask their true identities, and avoid suspicion as they travel around the globe. The business was born here in St. Kitts when Chris Kalin struck a deal with the government a decade ago following the collapse of the islands' sugar industry.Since then, passports have become its major export, providing hundreds of millions of dollars in income. In fact in 2014, the last year for which there are government statistics available, 40 percent of the government's revenue came from selling passports. It's provided St. Kitts and Nevis with hundreds of millions of dollars for infrastructure projects, private development, and tourism but a lot of the money is unaccounted for. More than 10,000 people have purchased citizenship here, but it's almost impossible to tell who they are because the information is not public. Chris Kalin doesn't like the words citizenship for cash, or any suggestion that all you need is money to get a passport. Chris Kalin: You have to go through a process. You have to apply. And you have to answer a million questions. And you have to undergo a background verification. And you have, at least in the properly run programs, you have to be a reputable person. And that's checked. But evidently, not that carefully. About the only way to identify people who have purchased St. Kitts citizenship is if they've happened to turn up on a list of international fugitives or gotten in trouble with the law, and St. Kitts and Nevis has had more than its share for two sleepy, little islands. Its passport holders have included a Canadian penny stock manipulator… a Russian wanted for bribery… a Kazak wanted for embezzlement… two Ukrainians suspected of bribing a U.N. official… and two Chinese women wanted for financial crimes. Chris Kalin: I think it's no secret that these islands have made decisions that are not always optimal. Steve Kroft: They've taken some bozos, as you would call them? Steve Kroft: What about crooks? Chris Kalin: Yes. It's goes all the way down to crooks, yeah, absolutely. And it tended for some time to attract quite a few people that I would never let into the country. But I'm not the government of St. Kitts and Nevis. Steve Kroft: But you set up their program. Chris Kalin: We helped to set up the program. But, you know, as it is, advisers advise, ministers decide. The island nation drew the ire of the U.S. Treasury Department three years ago after three suspected Iranian operatives were caught using their St. Kitts passports to launder money for banks in Tehran in violation of U.S. sanctions. It also had to recall more than 5,000 passports because they either didn't include a place of birth or were issued to people who had changed their names. Since then a number of reforms have been made, but questions remain. Peter Vincent: They're not transparent programs. There are not safeguards in place. Until 2014, Peter Vincent was the top legal adviser for U.S. Immigration and Customs Enforcement, part of the department of Homeland Security, which he says is well aware of all the vulnerabilities. In fact, before General John F. Kelly became secretary of the Department of Homeland Security, he expressed concern in a 2015 report that "cash for passport programs could be exploited by criminals, terrorists or other nefarious actors." Steve Kroft: Does that present a security threat, do you think? Peter Vincent: It does. In my opinion, the global community has established a very effective global security architecture to prevent terrorist attacks. I see these cash for citizenship programs as a gaping hole in that security architecture. But it's not stopped the programs from multiplying across the Caribbean…Dominica, Grenada, St. Lucia, and Antigua are all competing with St. Kitts now for customers and badly needed cash. Gaston Browne: So what are we supposed to do? Sit back and do nothing? You tell me. Gaston Browne, the prime minister of Antigua and Barbuda, says the revenue from its four-year-old program has kept the government from defaulting on its international loans and has turned the economy around. Antigua also claims to have among the strictest programs in the Caribbean. You actually have to show up here to get citizenship, albeit very briefly. Gaston Browne: Our law provides them to spend at least five days here. Steve Kroft: That sounds like a vacation. Gaston Browne: Yes. I understand. But however, we have made sure that at least there must be some face-to-face contact so we know who these people are. Steve Kroft: For five days. Steve Kroft: What kinda people are you looking for? Gaston Browne: We're lookin' for high net worth individuals. People who are established business people. Who are well-known. And to make sure that we get the crème de la crème. If so, they are recruiting them in some odd places. Last summer, Antigua announced it was opening an embassy in Baghdad hoping to sell passports to Iraqis. It didn't work out. But it's doing better next door in Syria after hiring a relative of President Bashar Al-Assad to represent them. Steve Kroft: Have you had any applications from Syria? Gaston Browne: Yes. We have had applications from Syria. Steve Kroft: And you've approved them. Gaston Browne: Syria is one of the areas in which we have had some concerns but did not place it on a restricted list. Prime Minister Browne told us instability breeds opportunity. Besides Syria, Antigua has sold citizenship to Iranians, Libyans, Pakistanis, and the people who brought condos in this half-built complex in the desert outside Dubai, 7,300 miles away from Antigua. Its website advertised, "Buy a villa in the UAE and get citizenship of Antigua." Steve Kroft: I mean, you said that you were looking for the crème de la crème. Gaston Browne: Crème de la crème. Steve Kroft: I mean, there's a developer in Dubai. Steve Kroft: Who is advertising that he's giving away passports to anyone who buys a condominium there. Gaston Browne: You don't believe that, right? Steve Kroft: Like you open a bank account, you get a free toaster. Gaston Browne: That is not so. Browne dismissed the sweet homes ads as advertising hype, saying the citizenship is not free or guaranteed. Somebody has to come up with $250,000 for Antigua and condo buyers must pass a background check. Gaston Browne: You have to go through all of the due diligence. Steve Kroft: What kinda due diligence do you do? Gaston Browne: Well, and that is where the crux of the matter lies. The prime minister claimed that the names of all applicants for Antiguan citizenship are screened by American intelligence and law enforcement agencies, and generally speaking due diligence in the Caribbean has improved substantially since the scandals in St. Kitts. The small island offices with a few people are now backed up by international firms that take the screening to a higher level. But ultimately it's up to each country to decide who gets a passport, and the Caribbean has a rich history of turning a blind eye to official corruption. It's affected the way the way passports are handed out, especially diplomatic passports, that entitle the bearer to all sorts of special privileges, which Peter Vincent says represents a much more serious security threat. Peter Vincent: The border officials at the receiving country, even without a visa, almost always admit an individual carrying a diplomatic passport. In addition, border forces are not entitled to search the luggage of diplomats like they are for regular tourists. They simply wave them through. The sale of diplomatic passports is not part of the citizenship by investment program, but it's gone on under the table, according to U.S. authorities, in places like Dominica, which has had a lot of dodgy diplomats. Lennox Linton: We had a diplomatic passport in the hands of Francesco Corallo, who, at the time, was on INTERPOL's list of most-wanted criminals. Lennox Linton, who heads the opposition in Parliament, says no one in Dominica had ever heard of Corallo until he was stopped by authorities in Italy. Lennox Linton: He said, "You can't detain me. I'm a diplomat." They said, "Diplomat? Diplomat of where?" He said, "Dominica." Then there's Dominican diplomat Alison Madueke, a former Nigerian oil minister charged with bribery and money laundering. And Rudolph King, a Bahamian fugitive from U.S. justice, who presented himself as Dominica's special envoy to Bahrain. Lennox Linton: What we were doing with an ambassador in Bahrain, I don't quite know. But they seem to think that there was some benefit in there for us. Steve Kroft: How he ended up appointing these people, diplomats. Steve Kroft: And what was the answer? Lennox Linton: The prime minister doesn't answer those questions. With vast sums of money flowing into these island nations, and more and more countries selling their citizenship, there is consensus that still more oversight and transparency is needed. But privacy and secrecy have always been a major selling point for people buying multiple passports, including Chris Kalin, the man who invented the business plan. Steve Kroft: How many do you have? Chris Kalin: I have multiple. Steve Kroft: So you don't wanna tell us how many you have? Chris Kalin: There's a few things in my life that, that I don't talk openly about. And I keep for myself. But I am Swiss originally and many people think I'm very Swiss and so I'll leave it at that. Our report in January sparked a flurry of reaction in the Caribbean. In Dominica, there were riots demanding the resignation of Prime Minister Roosevelt Skerrit for his handling of diplomatic passports. He denies any improprieties. The St. Kitts government deactivated more than 15,000 passports, including 91 diplomatic passports. And Antigua's program -- singled out by the U.S. State Department as "among the most lax in the world" -- has also recalled many of its diplomatic passports. Produced by Graham Messick and Evie Salomon.